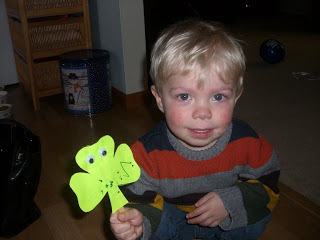 In honor of St. Patrick's Day, here are a Flashback Friday photo and video of my sweet boy - at two-and-a-half years old - showing off one of his first preschool art projects and singing "I'm a Little Shamrock" (otherwise known as "I a Yittle Sher-rerck") on St. Patrick's Day 2009. I'm a little shamrock, look at me. Here are my green leaves, one, two, three. "Have a happy St. Patrick's Day!" Will's face is red and his voice sounds scratchy because he'd spent the 20 minutes prior to taking the photo and filming the video crying...because in our first video attempt I tried to sing along with him. Shame on me.